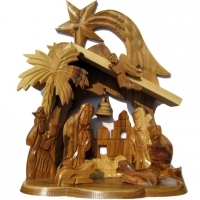 Add interest to your home with a wooden nativity set, from HolyLand-Gifts.com. All nativities include Mary, Joseph, three Wise Men, a Shepherd with Baby Jesus and a separate manger along with three animals that include a sheep, a cow, and a donkey. Bring home a powerful tool for meditation and prayer that takes you very close to the King of kings. Interestingly, the olive wood used to make a flawless scene becomes lovelier with age. It means that the heirloom quality Nativity will be a family favorite for years to come. Available in small or large sizes, each set gives you a reason to feel joyful and content with the beautiful hand carved gift from the Holy Land that will always be treasured. With our proud presence in the Christian community, we are committed to represent a wide and extensive assortment of great selection of religious items and superior customer service. So browse our website and find a perfect Wooden Nativity Set that speaks for itself and marks all good occasions in a genuine manner.